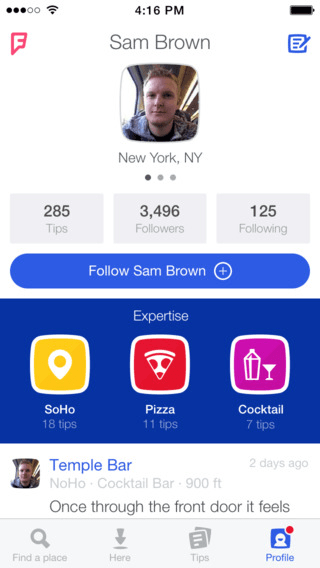 Foursquare introduced a major redesign to its. Gone are the check ins and the old-school layout of days past. 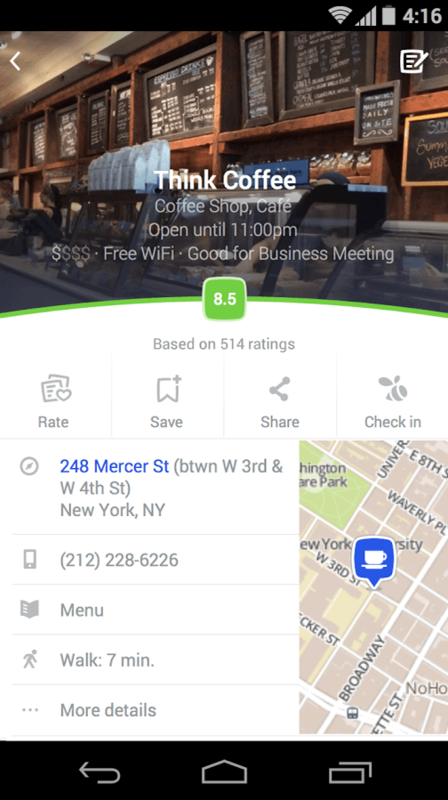 Foursquare 8.0 ushers in a whole new era for the local search app. 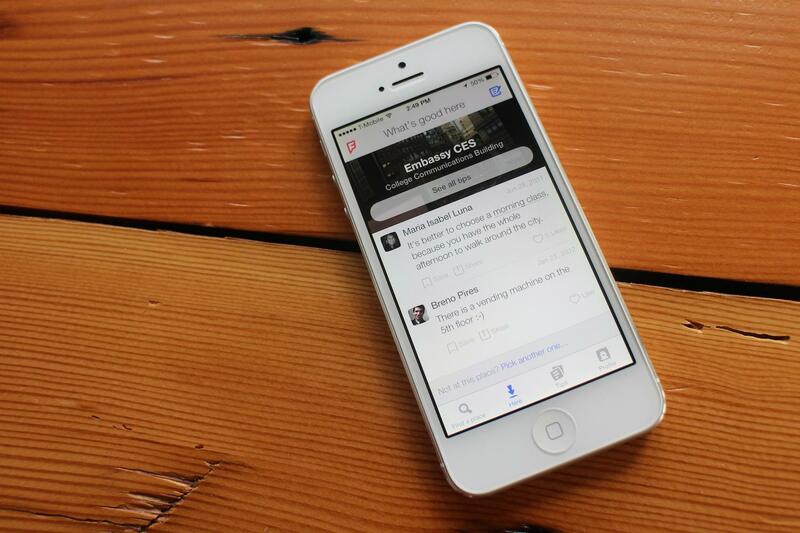 It plans to take on Yelp, Google Now, and other discovery apps. Just like before, you can search for places of interest nearby, read user reviews, and check out more info about each place. Foursquare will also recommend places based on your tastes, where your friends have been, and where you’ve been before. But now, you don’t have to check in all the time and you can discover new places with even more ease. We went on an adventure with the new Foursquare app and this is what we found. Foursquare then uses the key terms you’ve selected to give you better recommendations. You can also use your tastes to filter several other sections of the app or to help you find what you’re looking for faster. We selected a lot of bubbles, hoping that doing so would ensure that the recommendations were more accurate and indeed, they were. Foursquare knew that it was lunch time, so it showed me the best lunch places nearby first. It directed me mostly to cafes, health-food restaurants, and sushi joints because those were some of the bubbles we selected. On the main page of the app, the first section was “great lunch places nearby” and the second one was “your tastes nearby,” making it clear that selecting tastes helps Foursquare serve you better. You can add more tastes at any time in your profile section, so if you’re not in the mood to go through all that from the get go, that’s fine. The new Foursquare lets you search by different categories, including breakfast, brunch, lunch, coffee, dinner, and dessert. It also helps you find places categorized under nightlife, shopping, fun, and sights. All of these thematic categories are located in a blue menu at the top of the main app screen. As you scroll through the options, you’ll see recommendations for each below. The places are also viewable on a map, so you can compare the relative distance between several different venues. You can also search for places by name, type, and so on in the search bar at the top. 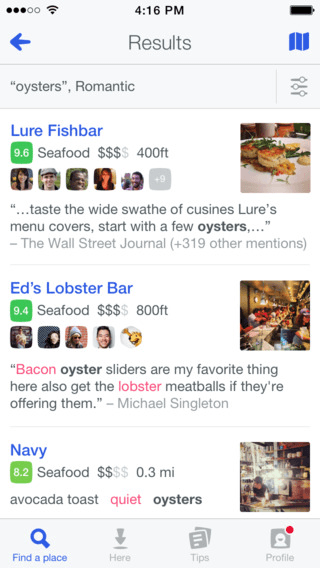 Foursquare lets you refine your search with various filters as well, if you want to speed up the overall process. You can sort by best match, distance, price, open hours, features, places you’ve saved or been to, categories, and other options, which are based on your tastes. If you’d rather find out what’s right in front of you, as opposed to a few blocks away, you can tap on the “Here” button in the bottom menu bar of the app. Foursquare will then show you “What’s good here.” Only one place will show up on the screen along with recommendations. 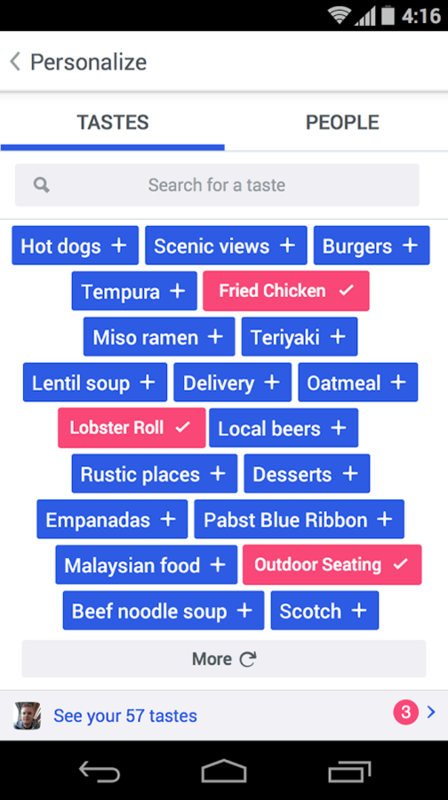 If you’re not interested in Foursquare’s suggestion, you can also select “pick another one,” and an entire list of places from each category will pop up. All of these places are right next to you, which is useful when you’re having a food crisis and just want to know what’s nearby. Once you’ve selected a place, you’ll see the name, a brief description, and the hours it’s open at the top of the screen on an image of the place. If you touch the image, you’ll see all the photos of that particular place. Right underneath the main photo is a user rating on a scale from 1 to 10. Below that, you’ll see options to rate, save, or share the place. Next up is the location, phone number, menu, reservation or ticket options, a map, and the distance to the attraction from your present location. Then you’ll see tags, some of which are your tastes, and tips from news organizations, users, and friends. Overall, we found this layout visually appealing and easy to understand. It looks slightly overwhelming on the iPhone’s small 4-inch display, but on a larger device, Foursquare’s new layout will look even nicer. The images and reviews are probably the most helpful parts, but it’s also great to see a menu and the hours of operation right at the top. The easy access to the map made searching on the fly a breeze, too. Finally, the new Foursquare has a “Tips” section in the bottom menu bar of the app where you can see recommendations from news organizations, the people you follow, your tastes, and what’s popular right now. All of these suggestions are based on your location. The new Foursquare really wants you to focus more on exploring and less on the social aspect of places. The main point of the app used to be checking in somewhere and making your friends want to join you there. The new Foursquare isn’t interested in making you popular. The app’s new focus is on being the best tour guide you could possibly have in any city at any time. Like Google Now and Yelp, the new Foursquare shows you where you want to go and helps you get there. It adds tons of reviews, photos, and great perspective to these suggestions, making it easier to really find what you want to see. The main benefit of Foursquare as opposed to Yelp is that it looks nicer and is easier to navigate. The thing it has over Google Now and Google Maps is that it doesn’t try to do everything — Foursquare just focuses on finding places you’ll want to see. In today’s world full of busy mobile apps, it’s nice to see one that encourages you to go explore, but with a focus.